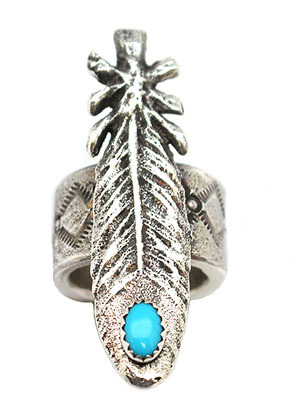 Sterling silver good weight tufa cast wide band with a tufa cast feather and one turquoise stone. Band measures 1/2" wide and has stamping all the way around. Feather measures 1 3/4" long by 1/2" wide at widest. It is Navajo crafted by Cody Custer. Only this one available and is a size 6.